Fifty Christian scholars and church leaders, a majority from Africa (Central African Republic, Democratic Republic of Congo, Ghana, Kenya, Malawi, Nigeria, Tanzania), but including participants from Asia, Europe, and North America, gathered at Africa International University (AIU) in Nairobi in March 2013 to discuss how the church should respond to witchcraft and to witch accusations. While a variety of secular human rights groups have organized against witch accusations and violence, this historic gathering marks the first large-scale, international, and interdenominational effort within the church and within the framework of Christian theology to address the growing presence of witch accusations and violence. 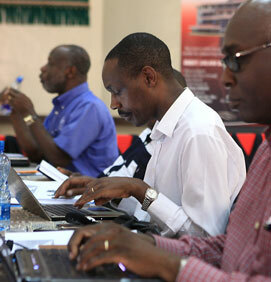 David K. Ngaruiya takes notes during a session. Meeting in small groups, participants shared case studies and identified theological and Biblical themes that can inform our understandings of witchcraft, can help counter witch accusations, and can underpin pastoral counseling. Biblical and theological scholars guided initial reflection on critical passages and doctrines. Plans were brainstormed for further research and writing, for curricular development, for partnering together with others to turn the tide on the modern epidemic of witch accusations and violence, and for finding additional funding to help make all this possible. The conference was sponsored by the Carl F. H. Henry Center for Theological Understanding at Trinity Evangelical Divinity School (TEDS) in Deerfield, Illinois as part of TEDS’ partnership with Nairobi Evangelical Graduate School of Theology (NEGST) of AIU. In addition to Dr. Robert Priest, Professor of Mission and Anthropology at TEDS, Dr. Tite Tiénou, Senior Vice President and Dean at TEDS, the conference was organized by Dr. James Nkansah-Obrempong, Dean of NEGST, and Dr. Steve Rasmussen, Lecturer in Missions and Intercultural Studies at AIU.